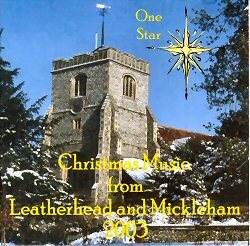 At long last our Parish Christmas CD entitled One Star is now complete and on sale. There have been many contributors to the album, from the United Benefice Choir (the combined choirs of Leatherhead and Mickleham), from music group leader Hedley Kay, and two pieces by David Oliver. This year we have included two tracks sung by the children of both St Marys and All Saints Infant schools. In Dulce Jubilo - two instrumental versions, with Hedley Kay on guitar and Lizzie Barret on treble recorder. The CD is on sale now price £8 with all proceeds going to church funds.